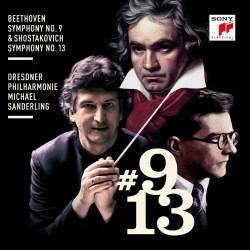 Under chief conductor Michael Sanderling this is volume five in the ongoing Dresdner Philharmonie series of the complete symphonies of Beethoven and Shostakovich for Sony. The coupling of Beethoven’s Ninth Symphony (‘Choral’) and Shostakovich’s Thirteenth Symphony (‘Babi Yar’) is a compelling one. Berlioz considered Beethoven’s Ninth the “culmination of its author’s genius” and with its setting of Schiller’s ‘Ode to Joy’ it comes across as a statement of the triumph of peace and freedom after repression and the horrors of war. Much less often encountered in the concert hall, Shostakovich’s Thirteenth is a riveting setting of Yevtushenko’s poem ‘Babi Yar’ that denounces anti-Semitism and highlights the genocide of Jews by Nazis near Kiev in 1941. This is the first ever Dresdner Philharmonie album recorded entirely at the recently refurbished Kulturpalast, its new Dresden home. In fact, on April 27th a performance of Beethoven’s Ninth was included in the concert to mark the Kulturpalast reopening and forms part of this recording. Dedicated to King Friedrich Wilhelm III of Prussia, Beethoven’s colossal Ninth Symphony is one of the most familiar works in the entire classical music repertoire. Composed in 1823-24 it’s unusual for its massive choral finale. It’s astonishing to think that by the time of its première in Vienna in 1824 Beethoven was profoundly deaf. In the opening movement Sanderling expertly controls the tightening of tension, eschewing the feeling of intense torment and fury one sometimes encounters. In the great Scherzo this reading is determined and intense, conveying a sense of emotional uncertainty. Under Sanderling a sense of spirituality pervades the beautiful slow movement, drawing in the listener. This is remarkably fine playing, with the radiant woodwind choir and brass and refined strings all serving to underscore the atmosphere of melancholy that reminds me of the pain of parting from a loved one. The crowning glory is the closing movement with its famous choral setting of ‘Ode to Joy’ which can seem like an independent work. Notable here are Sanderling’s superbly controlled climaxes while in the Presto section the resonant double basses establish a rock-solid foundation, conveying an impression of dark menace. In the choral section the quartet of soloists is nicely contrasted. Markedly the steadfast voice of bass Torben Jürgens is attractive with pleasing clarity, tenor Bernhard Berchtold is bright and taut with soprano Vera-Lotte Böcker displaying a glorious tone and alto Kristina Stanek is agreeably expressive. Tightly drilled under Michael Gläser, the exceptional MDR Rundfunkchor perform with splendid unity and focus. As opposed to those accounts in the record catalogue imbued with blood and thunder Sanderling takes a different route. Although potent and focused he doesn’t overload the weight of the playing, astutely holding back the frenzy, thus avoiding the chance of uncomfortable cacophony. Sanderling presides over a compelling performance that feels dignified with considerable humanity. At the conclusion of the score, the sense of exultation is complete. For those looking for an ultra-powerful ‘Choral’ Symphony the standout account is Furtwängler’s legendary March 1942 (Alte) Philharmonie, Berlin account with the Berliner Philharmoniker. Others fall short of this level of sheer ferocity, propulsive climaxes, torment and anger. Furtwängler’s quartet is Tilla Briem (soprano), Elisabeth Höngen (mezzo), Peter Anders (tenor) and Rudolf Watzke (bass) with the renowned Bruno Kittel Choir. Furtwängler’s account has the advantage of surprisingly good sound for its age and I would commend recordings on labels Société Wilhelm Furtwängler and, best of all, the version on Pristine Audio. I still admire the first recording I ever owned of this work which was part of a complete cycle of Beethoven symphonies and overtures on vinyl from Wiener Philharmoniker under Karl Böhm. The soloists are Gwyneth Jones (soprano), Tatiana Troyanos (contralto), Jess Thomas (tenor), Karl Ridderbusch (bass) with Konzertvereinigung Wiener Staatsopernchor. Böhm recorded his stirring account in 1971 at Musikverein, Vienna, which I have on a reissued CD set on Deutsche Grammophon. Of course, there is room for different approaches and Furtwängler is at one extreme. Broadly reminding me of Sanderling’s approach and exceptional too is the noble and polished yet resilient account from Sir Simon Rattle with Berliner Philharmoniker. Rattle’s choral forces comprise of Annette Dasch (soprano), Eva Vogel (mezzo-soprano), Christian Elsner (tenor), Dimitry Ivashchenko (bass) with the Rundfunkchor Berlin. Recorded live in 2015 at Philharmonie, Berlin this recording forms part of Rattle’s cycle of complete Beethoven symphonies on Berliner Philharmoniker Recordings that are now available in several formats i.e. Blu-ray video, CD, SACD, 24-bit Download and Vinyl. Scored for bass soloist, male chorus and orchestra Shostakovich completed his Thirteenth Symphony in 1962. As the work requires the singing of Russian texts in each of the five movements it is not surprising that this is one of his lesser performed symphonies in the concert hall. This relative neglect is no reflection on its quality, and I regard the Thirteen as one of Shostakovich’s masterworks. From back in 2013, I still fondly recall an outstanding performance I attended at Philharmonie, Berlin with Marek Janowski conducting Rundfunk-Sinfonieorchester Berlin with soloist Günther Groissböck (bass) and the Estonischer Nationaler Männerchor. Yevgeny Yevtushenko’s poem ‘Babi Yar’ is concerned with a ravine of that name near Kiev, the site of the slaughter of thousands of Jews carried out by Nazi forces and local collaborators during the Second World War. Yevtushenko’s poem had the temerity to reveal the Babi Yar massacre and expose a cover-up together with the injustice of a refusal by the Soviet authorities to raise a monument at the site. Even though there had been a slight thaw in the political climate since the death of Stalin, Shostakovich was still taking a considerable chance by setting a text that had become a symbol for Jewish suffering. The Soviet authorities did their best to sabotage the first performance in December 1962 by putting pressure on key performers to withdraw, however it went ahead. Sanderling pulls all his vocal and orchestral forces together with real assurance. His chosen tempi are satisfying, in a reading revealing much fine detail in the scoring. Taking centre-stage, steadfast bass Mikhail Petrenko proves masterly from start to finish with his dark, rich focused voice and conveys the harrowing text with fresh expression. Often captivating, the opening movement titled ‘Babi Yar’ – an Adagio – is an example of Shostakovich at his finest. The text explains the Babi Yar massacre and the absence of a memorial serving to hide and minimise its significance. Although unsettling and harrowing in character Sanderling reveals a steely beauty. Movement two ‘Humour’ – an Allegretto – is a heavily sardonic Scherzo about the power of humour but the underlying unsettling tone is never far away. The writing becomes weightier, increasingly angry and highly menacing. I was struck by the words “they’ve hidden humour away in dungeons, but they hadn’t a hope in hell …”. In the third movement an Adagio titled ‘In the store’, a dark trudging mood is underlined, depicting the incessant drudgery of the Russian women’s existence and the shortages they endured daily. Gradually the writing develops into a series of booming climaxes before slowly dying away. Here the bass part has higher territory to negotiate but Petrenko continues to sing magnificently. Opening quietly and maintaining a disturbing and menacing tone the fourth movement – a Largo, entitled ‘Fear’ – sets words describing how “Fears slithered everywhere like shadows, penetrating every floor.” A shattering climax at point 10:17 is followed by a tolling bell. Sanderling ensures a predominantly radiant quality to the captivating final movement ‘A Career’, an Allegretto. The text tells of men from history who sacrificed their careers for their beliefs. Moods of dark menace develop but the ending has an ethereal calm, with an alluring duet from violin and viola, then the celesta followed by a bell chime. I was struck by Petrenko’s marvellous rendition of the final verse. Throughout the Russian bass is in quite magnificent form and seems to inspire the Estonian National Male Choir who give a memorable performance singing with clear focus and unity, providing penetrating drama. In the Thirteenth, this breathtaking performance from Sanderling and his forces equals and possibly even surpasses the 2006 Grammy Award winning account from Mariss Jansons with bass Sergei Aleksashkin and the Chor und Symphonieorchester des Bayerischen Rundfunks recorded in 2005 on EMI. Worthy of attention too is Vasily Petrenko conducting Royal Liverpool Philharmonic Orchestra with Alexander Vinogradov (bass) with male voices of Royal Liverpool Philharmonic Choir and Huddersfield Choral Society. Petrenko recorded the work in 2013 at Philharmonic Hall, Liverpool on Naxos. Both symphonies were recorded for Sanderling in the outstanding acoustic of the Kulturpalast, Dresden with the sound engineers using a mix of part concert situations and part studio conditions. The stunning sound has clarity, presence and excellent balance between the solo voice, chorus and orchestral forces. Titled ‘The Whole of Humankind’ Wolfgang Stähr’s booklet essay is both helpful and interesting. This compelling double album is hard to fault with playing from Dresdner Philharmonie under Michael Sanderling of exceptional quality bolstered by excellent sound.